A fine spot for a shore dive and a launch site for the manacles. Full services in the cove. 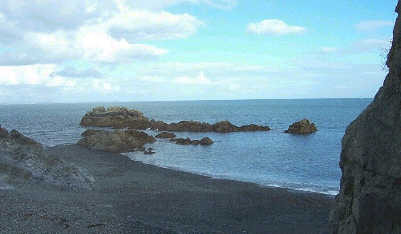 Porthkerris is both a dive site in its own right as well as a lunching point, providing easy access to the Manacles. There is a first class dive centre in the cove which offers a full range of services including: air, nitrox, a dive shop, charter boats and a cafe. A small charge is made for parking, launching and shore diving. The site is sheltered from north-westerly to south-westerly winds but is exposed to easterlies. 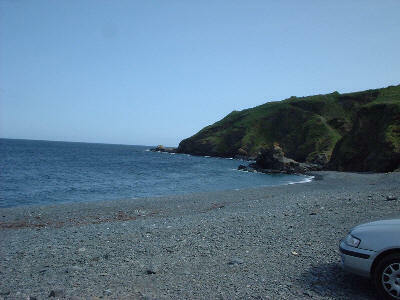 The pebbled beach is steep so a good 4WD is required for RIB launching. Alternatively, for a reasonable fee the dive centre will launch your RIB for you. Note a large car is still needed to pull the boat out of the cove and up to the main road, the gradient is about 1 in3 in places. There is some high quality snorkelling and shore diving here and it's a great spot for training. I particularly like night diving here and it's a good spot for a Barb-B-Q. The best shore diving is around the reef to the north where it is possible to cut through a small gully (just to the left of the right hand rock shown in the photo below) and around to the outside of the reef. The maximum depth on the outside of the reef is about 18m. The whole dive takes about 50 minutes at a relaxed but constant pace. However, take note of the tide when planning to dive as it flows quite strongly between the reef and the shore. The marine life can be quite varied here, the sea bed is rock covered weed surrounded by pebbles. 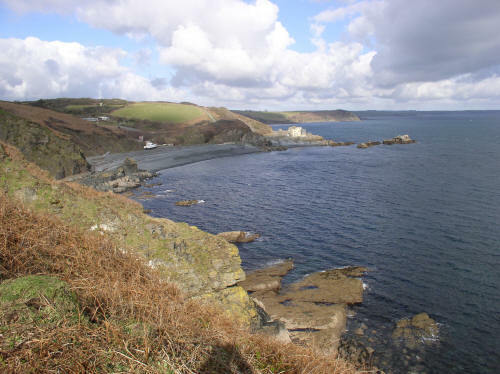 The usual shallow water species can be found here including wrasse, pollack, edible crabs and a resident lobster (please leave them for others to enjoy). Among the more exotic species to be found are tompot blennies, squat lobsters (best seen at night), cuttlefish and squid. 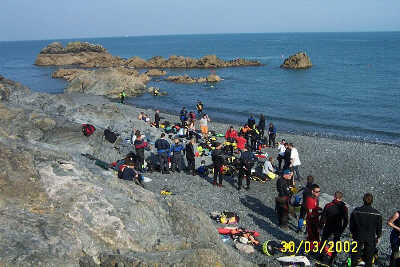 For more information contact Porthkerris Divers on 01326 280620. The best shore diving is around the reef to the north. Care should be exercised when shore diving or snorkelling due the the large volume of surface traffic. Shore diving is usually carried out from the north of the beach, between the island and the shore, where boats are discouraged. Boat handlers beware, there are several reefs between Porthkerris and the Manacles, many of them being hazardous to even the shallowest draught vessel. Study the charts and get local advice. The author(s) of this site do not claim to be expert on the topics covered and any information given should not be relied upon solely for dive planning and safety, always double check for yourself.